Our 100% Pure Amagansett Sea Salt blended with Aleppo Pepper and a touch of Annatto. 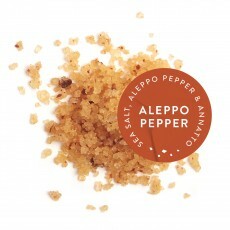 The Aleppo pepper lends a slightly Mediterranean, tangy, ancho-like flavor to food, but without too much heat. The Annatto offers a whisper of nutmeg. Together, the salt's brininess and these flavors create a wonderfully flavorful finishing salt that brings out the best flavor of the underlying food, adds zest, and dresses the dish with an appealing reddish-gold accent. This salt blend pairs perfectly with seafood, vegetables, and the rim of your cocktail glass. This blend is one of our favorites! It tastes and looks great on everything we have tried. Shortly after we perfected the recipe, we cut a honeydew melon into cubes, put them on bamboo skewers and sprinkled a few crystals of this salt on each melon cube for a sweet, salty and zingy snack. We then made a pitcher of pomegranate margaritas, rimmed the glasses with this salt blend and toasted our ingenuity! Oh yes, we dressed fresh fluke with this salt for dinner. We have been blending Aleppo pepper with our salt since 2011. The pepper is named after Aleppo, an ancient city along the Silk Road in northern Syria, a UNESCO World Heritage site and the largest city in civil war-torn Syria. We are dismayed by the events transpiring in Syria, especially in Aleppo, and that we are no longer able to receive Aleppo peppers grown in or near Aleppo. In response, we have taken two actions: First, we are now sourcing Aleppo peppers from The Hoppy Acre, a neighboring farm just a pepper's throw from our salterns. Second, we are donating one-half of the profits from online sales of our Aleppo pepper blended salt to Doctors Without Borders. Also known as Médecins Sans Frontières, this non-profit international relief organization is currently providing direct medical care in six hospitals and four health centers in Syria, while also sending medical supplies to areas they can't physically access.